We drove all the way to Dubrovnik from Split enjoying the breathtaking view of the Adriatic Sea. The Croatian Airline operates domestic flights from Zagreb to Dubrovnik, but it was too good to miss the beautiful view spreading in front of us. Usually, it takes about 8 hours from Zagreb (3.5 hours from Split) to Dubrovnik by car on the highway. 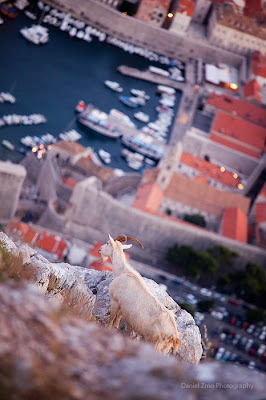 We started the day in Dubrovnik from Srđ mountain from its top, you will see the amazing view of the entire old city of Dubrovnik. To get to the top of the mountain, we used the cable car (87Kn return tickets). We all excited as the cable car slowly moving up to the top. The photos above were taken from mount Srđ. I think this it the best viewpoint of Dubrovnik. 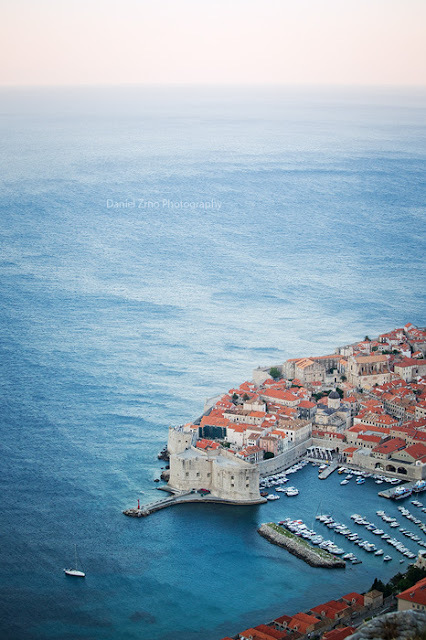 The contrast between the blue Adriatic Sea and orange roofs was very beautiful. On the top of Srđ mountain, a big cross was standing very quietly. This cross was destroyed during the Homeland War (1991 - 1995), but was restored as a memorial for those who died and were victims of the war. There are several great sightseeing points along the road to mount Srđ in addition to the cable car station. So, if you have time, hire a taxi to Srđ. 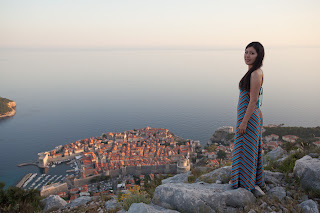 We drove to the top of the mountain in the early morning to take photos of Dubrovnik. The early morning of Dubrovnik is completely different from hustle and bustle of the day. It was very quiet. There were only us on Srđ. It was very indulging moment to have all this quiet morning just for us while witnessing the morning sun gradually lit the old city. The photo above was taken in the early morning. It was very very windy morning and you can see that wind blew the sea and the Adriatic Sea was very wavy. The colour of the sea looked a bit different from the daytime. It was more refreshing light blue colour. The old city of Dubrovnik lit by the morning sun. This photo was taken just before the sunset. Compared to the very strong sun during the day, the city was wrapped by the warm and calm colour of the Sky. The sunset at Dubrovnik. It was very romantic :) It seemed like everyone on mount Srđ was captivated by this beautiful sunset and just quietly gazed at the superb view of Dubrovnik at sunset. Usually, the sunset during summer is around 8:30pm to 9:00pm. This was taken just after the sunset. 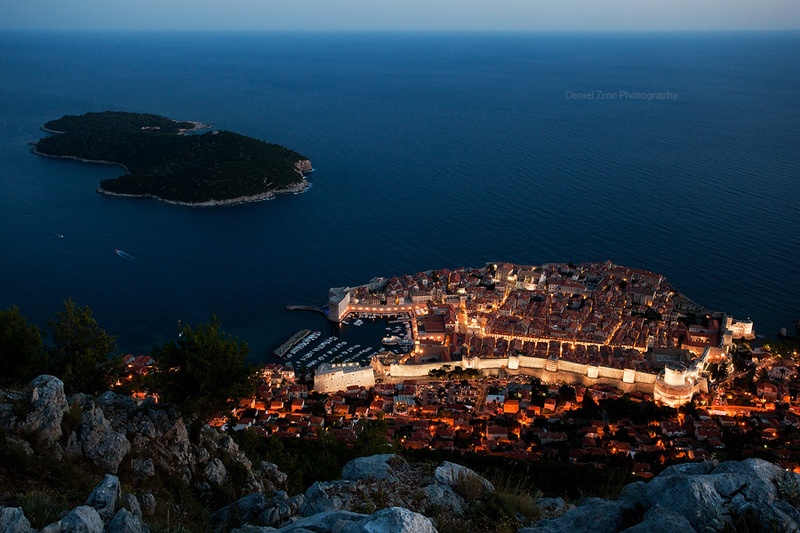 All the lights were lit in the city, which made Dubrovnik shine like a gem stone in the darkness. Even from the top of mount Srđ, we heard some live music. It was very lively town.